Our BizTalk installation consists of two load balanced nodes B1 (10.137.10.1) and B2 (10.137.10.2) which process and route incoming SOAP messages. and route the response back to the original caller. In front of the web service there is an nginx reverse proxy (RP, WS/RP: 145.21.186.179). The connection between the BizTalk nodes (B1, B2) and the WS (or actually RP) will be HTTPS (TLSv1) with mutual/two-way authentication. All goes fine when messages are routed by node B1. A proper TLSv1 handshake is performed and eventually application data (the request and response message) are exchanged. See screenshot below. Messages processed by node B2 fail. We don't see a proper TLSv1 handshake. After the server requests the certificate from the client it goes silent. Could you guys and girls think of one reason why this could happen? We checked the configuration on both B1 and B2 and we don't see deviations. Could this be a problem with SChannel? What would be a reason to not send the client certificate upon server request? Also the event logs don't give us any leads. 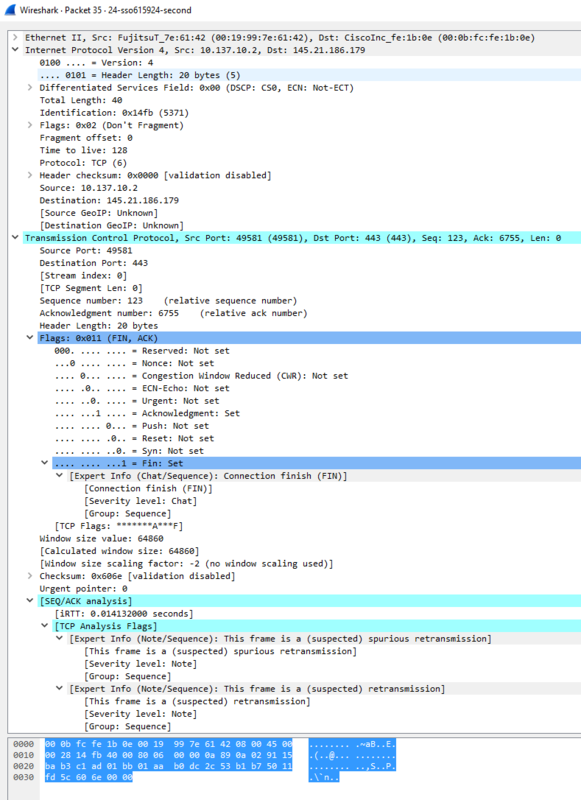 From the Wireshark trace on B2, we see that the client is simply not responding at all; after one minute, the server grows impatient and closes the connection. This is probably not a problem of certificate availability on B2: if SChannel simply believed that it had no appropriate certificate, then it would send back an empty Certificate handshake message. At that point, B2 perfectly knows that it is its turn to talk, so if it does not, then that means that it is occupied elsewhere. There are several matching certificates on B2, and the software on B2 believes itself to be "interactive"; it is thus displaying a certificate selection popup and waits for the user to choose the certificate. I have seen cases where software running as a service account would "show" a popup on a hidden desktop (not the one of the user currently logged in). The private key is access-protected. It is possible to enable password-based access control on private keys in Windows CryptoAPI (basically, the private key is stored with password-based encryption). In that case, any access will trigger a popup requesting the password entry. For non-interactive systems, this won't go well... (see above). Note that the private key is needed for the CertificateVerify message from the client, after the Certificate and ClientKeyExchange messages, but since these three messages are all "handshake", SChannel will group them in a single record, so in that situation it would be normal not to see the Certificate and ClientKeyExchange messages. The client is busy validating the server's certificate. Such a validation may entail talking to a lot of other systems, to gather additional intermediate CA and obtain CRL or OCSP responses. These are outgoing requests, so your network installation might block them. Try making a Wireshark trace that includes all traffic, not just the specific TCP/SSL connection; in particular, DNS requests that get no answer should be investigated. A quick test would be to try to connect from B2 to the target server WS with Internet Explorer. IE will use SChannel (contrary to openssl.exe). Run IE with an account that has access to the expected client certificate and key. This will show you any "interactive" feature. Not the answer you're looking for? Browse other questions tagged tls authentication certificates openssl or ask your own question. What additional protection required for authentication and messages sending in addition to TLS? 519 tls handshake attempts in 3 seconds, with 415 within one second, was this a DDOS attack?